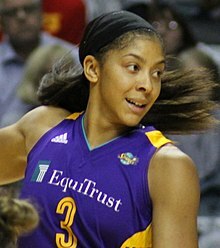 Candace Nicole Parker (born April 19, 1986) is an American professional basketball player who plays for the Los Angeles Sparks of the Women's National Basketball Association (WNBA). She is the younger sister of former NBA player Anthony Parker and was the first overall pick in the 2008 WNBA Draft. In high school, Parker won the 2003 and 2004 Gatorade National Girls Basketball Player of the Year awards, becoming just the second junior and the only woman to receive the award twice. A versatile player, Parker mainly plays the forward position. In college she was listed on Tennessee's roster as a forward, center and guard. Parker was the first woman to dunk in an NCAA tournament game and the first woman to dunk twice in a college game. She set both milestones as a redshirt freshman on March 19, 2006. Parker became the second player to dunk in a WNBA game on June 22, 2008. Prior to her first WNBA game, Parker had signed long-term endorsement deals with Adidas and Gatorade. In leading the Lady Vols to two consecutive national championships, Parker was named the Final Four's most outstanding player in both occasions, and was a two-time consensus national player of the year. Parker has won a WNBA championship (2016), two WNBA Most Valuable Player Awards (2008, 2013), WNBA Finals MVP Award (2016), WNBA All-Star Game MVP (2013), two Olympic gold medals (2008, 2012), and the WNBA Rookie of the Year Award (2008). Parker has been selected to six all-WNBA teams and five all-star teams, and was the first player to win the Rookie of the Year and the WNBA Most Valuable Player Award in the same season. Parker was born on April 19, 1986 to Sara and Larry Parker in St. Louis, Missouri. She has two older brothers: former NBA basketball player Anthony Parker and Marcus Parker, who is a doctor. Like her older brother Anthony Parker, she attended Naperville Central High School in Naperville, Illinois in 2004. While in high school, Parker led her basketball team to Class AA state titles in 2003 and 2004, and compiled a school-record 2,768 points (22.9 points per game) and 1,592 rebounds (13.2 rebounds per game) while starting 119 of the 121 games in which she played. She is the only two-time award winner of the USA Today High School Player of the Year, winning the award in 2003 and 2004. Parker also won the Naismith Prep Player of the Year Award and Gatorade Female Basketball Player of the Year Award in 2003 and 2004. In 2004, she was named Gatorade Female Athlete of the Year, WBCA All-American and McDonald's All-American. She participated in the 2004 WCBA All-America Game where she scored 9 points. She was also a consensus pick as player of the year in Illinois in 2002, 2003, and 2004, and was a four-year member of the All-State first team. On December 27, 2001, Parker dunked for the first time in competition as a 15-year-old sophomore at Naperville Central High School, this is believed to be the first slam dunk by a female athlete in Illinois. On July 11, 2003, Parker tore her ACL in her left knee in a summer league game. On November 11, Parker announced her commitment to Tennessee on ESPNEWS, becoming the first women's player to announce the oral commitment live on ESPNEWS. On December 29, Parker returned to action for Naperville Central and a few months later, led her team to its second consecutive state title. On March 29, 2004, Parker won the slam dunk contest at McDonald's All-American Game, becoming the first female to win the event and beating the likes of Josh Smith and J. R. Smith. In August 2004, Parker led the undefeated USA Junior World Championship team to a gold medal with 16.6 points and 8.8 rebounds per game. While training, Parker had a relapse of knee pain and was required to undergo surgery both the lateral meniscus and the lateral articular cartilage in her left knee. Parker entered the University of Tennessee in the fall of 2004. On February 17, 2005, Tennessee announced Parker would redshirt her first season due to a knee injury. Parker started for the Tennessee Lady Vols during the 2005-06 season. On March 19, 2006, in an NCAA tournament first-round game against Army, she became the first woman to dunk in an NCAA tournament game, then became the first woman to dunk twice in an NCAA tournament game. She was the SEC Rookie of the Year (Coaches and AP) and helped the Lady Vols win the 2006 SEC tournament championship. With 17 seconds remaining in the SEC tournament championship game against LSU, Parker hit the game-winning shot. She was named tournament MVP and was named to the 2006 Kodak All-America team, making her one of the few to ever receive the award as a freshman. However, in the NCAA tournament regional finals against North Carolina, Parker got in early foul trouble and was out of the game for much of the first half, Tennessee ultimately lost the game. Parker was the only college player named to the USA squad for the 2006 FIBA World Championship for Women in Brazil. The USA squad finished in third place. On January 28, 2007, in an away game against Alabama, Parker scored her 1,000th career point as a sophomore, making her the fastest player in Lady Vol history to do so. She did it in 56 games, beating Chamique Holdsclaw's mark of 57 games and Tamika Catchings's of 58 games. On March 1, at the SEC tournament in Duluth, Georgia, Parker was named the 2007 SEC Player of the Year. On April 3, she led the Lady Vols to their first National Championship victory since 1998, beating Rutgers 59–46, Parker finished the game with 17 points and earned the tournament's Most Outstanding Player honor. Parker announced on February 21, 2008, that she would forgo her final season of eligibility at Tennessee in order to focus on the 2008 Olympics and pursue a professional career in basketball. She graduated with her incoming class in May 2008. A sports management major who had a 3.35 grade-point average as of December 2007, she was named University Division I Academic All-American of the Year in women's basketball for 2008 by the College Sports Information Directors of America. On April 8, 2008, Parker led the Lady Vols to their second straight NCAA women's title, the eighth championship for Tennessee, and the last for legendary coach, Pat Summitt. She was also named the Most Outstanding Player for the second consecutive tournament, joining Cheryl Miller, Chamique Holdsclaw and Diana Taurasi as the only female players to have done so. She won the honor despite suffering a dislocated shoulder during her team's regional finals win, but returned and led the Lady Vols to the title. While at Tennessee, she compiled a record of 100 wins and 10 losses and averaged 19.4 points, 8.8 rebounds, 2.6 assists, 1.9 steals and 2.4 blocks per game. Shortly after the NCAA victory, Parker was selected as the first pick in the 2008 WNBA Draft by the Los Angeles Sparks on April 9, 2008. She played alongside Olympic teammates Lisa Leslie and DeLisha Milton-Jones. Shannon Bobbitt, Parker's teammate at Tennessee, joined the Sparks after being drafted in the second round. On May 17, 2008, in her debut game against the Phoenix Mercury, she scored 34 points, 12 rebounds and 8 assists. Her 34 points broke the record for a rookie in a debut game. The record was previously held by Cynthia Cooper, who scored 25 points in her debut game in 1997. It is a record that still stands to this day. Parker was named the Hanns-G 'Go Beyond' Rookie of the Month for the month of May and July 2008. On July 9, 2008, Parker scored a career-high 40 points, along with 16 rebounds and 6 assists, in an 82–74 overtime win against the Houston Comets. Parker was one of 11 people suspended in the Sparks-Shock brawl on July 21, 2008. In August 2008, the WNBA suspended play for a couple of weeks to allow some of their players to join the national team at the 2008 Summer Olympics. Parker was selected to go, and the US team cruised with eight straight victories to win the gold medal. Parker averaged 9.4 points and 4.5 rebounds per game, and scored 14 points in the final game. On October 3, 2008, Parker became the first WNBA player to win both the Rookie of the Year and the Most Valuable Player awards in the same season, joining Wilt Chamberlain and Wes Unseld as the only professional American basketball players to win both ROY and MVP trophies in the same season. Parker missed the first eight games of the 2009 WNBA season after giving birth to her daughter, Lailaa Nicole Williams. By this time, the Sparks acquired Tina Thompson and Betty Lennox to help carry the team during Parker's absence. On June 30, Parker returned to practice with her teammates for the first time. She played her first game back from maternity leave on July 5, 2009. Parker was named to the All-WNBA second team and All-Defensive second team despite missing almost a full month, due to her maternity leave. She had averaged a career-low in scoring but led the league in rebounding by the end of the season. Parker helped the Sparks get to the Western Conference Finals, but lost in three games to the eventual champions, the Phoenix Mercury. In the playoffs, Parker averaged 18 points and 10.7 rebounds per game. In 2010, Parker played only 10 games and was sidelined for the rest of the season due to a shoulder injury, she would also miss the playoffs. In 2011, Parker played her first six games. During the seventh game, with 5:56 left in the third quarter, Parker went down after grabbing a defensive rebound and making brief contact with Quanitra Hollingsworth. After getting an MRI on June 27, she found out she had a torn meniscus in her right knee. She had been voted as an All-Star during the season, but the injury would cause her to miss the 2011 WNBA All-Star Game. Six weeks later, she returned and played the remainder of the season, but the Sparks were eliminated from playoff contention with a disappointing 15–19 record. In 2012, Parker had re-signed with the Sparks to a multi-year deal once her rookie contract expired. She had played the full season and helped her team to a 24–10 record, making the playoffs as the second seed in the west. In the first round, they beat the San Antonio Stars two games to none. 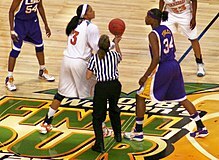 In the Western Conference Finals, against the Minnesota Lynx, the Sparks lost two games to none, while Parker scored 33 points, grabbed 15 rebounds, and had 4 blocks in a must-win game two, which they lost, 80-79, therefore ending their season. Parker was very emotional following the loss, hugging her mother Sara with tears. On July 27, 2013, in her sixth season, Parker played in her first All-Star game. She scored 23 points and grabbed 11 rebounds in a come from behind win for the West and was named WNBA All-Star MVP. The Sparks finished with the same record (24–10) as the year earlier, again earning the second seed in the Western Conference. On September 19, Parker was named the 2013 WNBA Most Valuable Player. Parker became the fifth player to earn multiple WNBA MVP awards, joining Lisa Leslie (3), Sheryl Swoopes (3), Lauren Jackson (3) and Cynthia Cooper (2). The Sparks faced the Phoenix Mercury in the Western Conference Semifinals. In game one, at Staples Center, the Sparks lost, forcing them to win in game two, at Phoenix to stay in the series. In game two, Parker scored 31 points and had 11 rebounds to lead the Sparks to a win, bringing the series back to L.A. for a game three. In a nailbiter, the Sparks lost on a last second jumper by Phoenix rookie Brittney Griner, ending the Sparks' season by one point for the second straight year. In January 2014, Williams Group Holdings abruptly announced they would relinquish their ownership of the Sparks. For a brief time, the Sparks future in Los Angeles was in some jeopardy. Despite major uncertainty, a month later the team was purchased by an investment group including Magic Johnson, with promises of bringing a championship to Los Angeles. The team went into the All-Star break with an unexpected 10–13 record. Immediately after the break, head coach Carol Ross was let go and General Manager and former player, Penny Toler, assumed the position of coach for the remainder of the season. Parker led her team to finish with a 16–18 record and clinched the number 4 seed to head to the playoffs for the 14th time in franchise history and 6th time for Parker. Despite enormous effort from her in the series, they lost 72–75 in Game 1 and 93–68 in Game 2 to the eventual champions the Phoenix Mercury, marking the second consecutive year the Mercury knocked the Sparks out of the playoffs in the semi-final round. Parker averaged 19.4 points, 7.1 rebounds, 4.3 assists, and 1.3 blocks per game in the regular season. On April 9, 2015, Parker announced she would miss an undetermined amount of the season to rest. Prior to the season, Brian Agler was hired as the Sparks' new head coach. Parker returned to the Sparks after the All-Star break on July 29. Despite missing more than half of the season, she filled the box score like no player ever had before. In 16 regular-season games, Parker set a career high of 6.3 assists per game, ranking 1st in the league, two more than her previous career high, a number that only 7 other players in WNBA history have matched; all except Parker were guards. Additionally, she averaged 19.4 points (4th), 10.1 rebounds (1st), 1.8 blocks (4th) and career high 1.9 steals (5th) per game. Her unbelievable performance earned her the Western Conference Player of the Month for August. The Sparks had been struggling with a 3–15 record before her return, one of the worst records in franchise history. However, Parker managed to lead her team to the number 4 seed with a 14–20 record. The team put up incredible effort against the number 1 seed, Minnesota Lynx in the series, losing game one by only 2 points. In game two, Parker had 25 points and 10 rebounds to lead the Sparks past the Lynx 81–71 and force a game three. Despite leading all scorers with 28 points and had 13 rebounds, Parker couldn't help her team in game three as they lost to the Lynx 91–80. Parker was named a part of the 2015 All-WNBA Second Team. In 2016, Parker re-signed with the Sparks as an unrestricted free agent. During the season, Parker averaged 15.3 points per game, becoming the team's second option next to Nneka Ogwumike who led the team in scoring and won the MVP award. However, in late June, Parker's college coach and mentor, Pat Summitt, died at the age of 64 from Alzheimer's disease. That night, against the Dallas Wings, Parker had an incredible performance in the second half, finishing the game with 31 points, and had her season high of rebounding with 13, guiding her team to a victory. In an emotional post-game interview, she dedicated the season to Pat. With a supporting cast of Nneka Ogwumike and Kristi Toliver, the Sparks were a championship contender in the league, finishing 26–8. With the WNBA's new playoff format in effect, the Sparks were the number 2 seed in the league with a double-bye to the semi-finals (the last round before the WNBA Finals) facing the Chicago Sky. The Sparks defeated the Sky 3–1 in the series, advancing to the WNBA Finals for the first time since 2002. In the WNBA Finals, it was only the second time in league history where two teams from the same conference faced each other in the Finals due to the new playoff format, as the Sparks faced the championship-defending Minnesota Lynx. This finals series proved to be the best the WNBA had ever seen, with Parker being at the forefront of the Sparks' success. For Game 3, in Los Angeles, Parker put up her best performance of the finals thus far, contributing 24 points, 9 rebounds, and 2 assists to help the Sparks take a 2–1 series lead, with a dominant 92–75 win. This put Parker one win away from her first title, as the Sparks already had one victory in their hands. However, the Lynx upset the Sparks on their home court in Game 4 with an 85–79 win, forcing a winner-take-all Game 5. The Sparks would end up winning the decisive Game 5 on the road, that ended with a game winning close range shot by Parker's teammate, Nneka Ogwumike, who put the Sparks ahead 77–76 with 3.1 seconds remaining after grabbing an offensive rebound. The Sparks claimed their first championship since 2002. After the game, in tears, Parker uttered the words "this is for Pat," insinuating that the championship win was in honor of Pat Summitt. Parker won her first championship and won Finals MVP. In Game 5 of the series, Parker had scored a game-high 28 points along with 12 rebounds. Also in 2016, Parker was named in the WNBA Top 20@20, a list of the league's best 20 players ever in celebration of the WNBA's twentieth anniversary. In February 2017, Parker signed a multi-year contract extension with the Sparks. During the 2017 season, Parker was voted into the 2017 WNBA All-Star Game, making it her fourth all-star nomination. On July 28, 2017, Parker became the sixth player in league history to record a triple-double in an 85–73 win over the San Antonio Stars as she scored 11 points, tied her career-high of 17 rebounds along with a career-high 11 assists. She would finish the season averaging 16.9 points per game, as the Sparks repeated the same regular season success as last year as the number 2 seed in the league with a 26–8 record, receiving a double-bye to the semi-finals. In the semi-finals, the Sparks defeated the Phoenix Mercury in a 3-game sweep. The series ended on a game-winning layup by Parker with 2.9 seconds left in Game 3, putting the Sparks up 89–87 as they advanced to the WNBA Finals for the second season in a row, setting up a rematch with the Minnesota Lynx. In Game 3 of the 2017 WNBA Finals, Parker set the record for most steals in a Finals game with 5 steals along with 13 points, 7 rebounds, 5 assists and 3 blocks in a 75–64 win, putting the Sparks up 2–1 in the series. However, the Sparks would lose the next two games, failing to win back-to-back championships as they lost to the Lynx in five games. On July 10, 2018, Parker made history with a stat line of 21 points, 10 assists, 9 rebounds, 4 steals and 2 blocks in a 77-75 overtime victory against the Seattle Storm, making her the first player in WNBA history to achieve such a stat line. On July 15, 2018, Parker scored a season-high 34 points along with 11 rebounds and 9 assists in a 99-78 victory over the Las Vegas Aces. On July 19, 2018, Parker was voted into the 2018 WNBA All-Star Game, making it her fifth all-star nomination. Parker finished off the season, averaging 17.9 ppg and the Sparks finished as the number 6 seed with a 19-15 record. In the first round elimination game, they faced the rival Minnesota Lynx, in which they won 75-68 to advance to the second round. In the second round elimination game, the Sparks lost 96-64 to the Washington Mystics, ending their run of two consecutive finals appearances. Parker, was a member of the USA Women's U18 team which won the gold medal at the FIBA Americas Championship in Mayagüez, Puerto Rico. The event was held in August 2004, when the USA team defeated Puerto Rico to win the championship. Parker was the leading scorer for the team, averaging 16.6 points per game. Parker played for Team USA in 2008, winning her first gold medal as USA beat Australia 92-65. Parker was invited to the USA Basketball Women's National Team training camp in the fall of 2009. The team selected to play for the 2010 FIBA World Championship and the 2012 Olympics is usually chosen from these participants. At the conclusion of the training camp, the team traveled to Ekaterinburg, Russia, where they competed in the 2009 UMMC Ekaterinburg International Invitational. Parker played for Team USA at the 2012 Summer Olympics. She led the team in rebounds and blocks throughout the olympics, helping them win another gold medal, as they beat France 86-50 in the gold medal game. Despite her performance in the previous Olympics and participation in the national team training into the summer of 2016, ultimately Parker wasn't selected to play for Team USA in the 2016 Summer Olympics. USA Basketball extended an invitation to Parker for the 2017-2020 national team training camp, but she declined, in light of her exclusion from the team for the Rio games. During each WNBA off-season from 2010 to 2015, Parker played for UMMC Ekaterinburg of the Russian League, winning five consecutive championships with the team. Parker played with teammate, Kristi Toliver in her final off-season with the team. During the 2015-16 WNBA off-season, Parker signed with the Guangdong Dolphins in January 2016, to replace Yelena Leuchanka during the WCBA playoffs. In February 2017, Parker signed a 2-month contract with Fenerbahçe Istanbul of the Turkish League. In December 2017, Parker signed with the Xinjiang Tianshan Deers of the Chinese League for the 2017-18 WNBA off-season. On May 7, 2007, People named Parker to its 100 World's Most Beautiful people list. On November 13, 2008, Parker married Shelden Williams, who played college basketball at Duke University and also played in the NBA. The couple have a daughter named Lailaa Nicole Williams, born on May 13, 2009. In 2013, the couple purchased a 7,000-square-foot (650 m2) home in Encino, Los Angeles, for $3.56 million. In November 2016, the couple split up after eight years of marriage when Williams filed for divorce, citing "irreconcilable differences". They had been living separately for three months prior to the divorce. TMZ reported in April 2018 that the former couple had sold their home and split the profits from the sale, and that Parker agreed to a one-time payment of $400,000 as opposed to ongoing spousal support for Williams upon finalizing the divorce, as well as their mutual agreement to joint legal and physical custody of their daughter, with neither parent receiving child support payments from the other. During her youth in the Chicago area, Parker grew up adoring the Chicago Bulls and was a Michael Jordan fan. Her all-time favorite player is Ron Harper, of whom she has a picture hanging in her bedroom. She has a dog named Prada. She previously had a St. Bernard mix named Fendi, with whom she appeared in an anti-fur ad for PETA. Parker also serves as a studio analyst for CBS Sports NCAA men's tournament coverage and NBA on TNT. ^ "2006-07 Lady Vols Roster". Retrieved November 11, 2008. ^ "Parker has opportunity to declare for '07 WNBA draft". Sports Illustrated. March 22, 2007. Retrieved March 28, 2007. ^ Gutierrez, Melody (April 2, 2007). "College stars boost WNBA draft suspense". The Sacramento Bee. Archived from the original on February 7, 2008. Retrieved April 4, 2007. ^ "Offseason 2008-09: Overseas Roster". Wnba.com. January 8, 2009. ^ Rovell, Darren (April 22, 2008). "Parker Signs With Adidas and Gatorade". ^ "Candace Parker Signs Endorsements With Gatorade, Adidas". www.sportsbusinessdaily.com. Archived from the original on January 5, 2018. Retrieved November 27, 2016. ^ Biography Today. Detroit, Michigan: Omnigraphics. 2010. p. 143. ISBN 978-0-7808-1058-7. ^ Thomas, Louisa (June 19, 2013). "Candace Parker Knows What She Wants". ^ "WBCA High School All-America Game Box Scores". Women's Basketball Coaches Association. Archived from the original on July 15, 2014. Retrieved June 29, 2014. ^ "Parker to pursue Olympics and pro career" (Press release). University of Tennessee Women's Athletic Department. February 21, 2008. Archived from the original on July 17, 2011. Retrieved March 3, 2008. ^ a b College Sports Information Directors of America (February 26, 2008). "Parker is Academic All-American of the Year". University of Tennessee Women's Athletic Department. Archived from the original on July 17, 2011. Retrieved March 3, 2008. ^ "Women's Basketball Player stats". NCAA. Retrieved September 22, 2015. ^ Jeré Longman, with The AP (April 9, 2008). "Summitt wins again when it matters". iht.com. Retrieved April 9, 2008. ^ Bagnato, Andrew (May 17, 2008). "Parker scores 34, the most ever in a WNBA debut". Google. Associated Press. Archived from the original on August 1, 2008. Retrieved May 17, 2008. ^ Arritt, Dan (June 23, 2008). "Parker dunks to cap win". The Los Angeles Times. ^ "Parker Named Hanns-G Rookie of the Month". ^ "Parker's career-high 40 points give Sparks OT win". ^ "Sparks' Parker wins MVP, rookie of year honors - WNBA - ESPN". Sports.espn.go.com. October 5, 2008. ^ "Parker Returns To Practice". Wnba.com. July 3, 2009. ^ "Parker to Undergo Shoulder Surgery; Will Miss Balance of WNBA Season". ^ "2011 WNBA All-Star Game - The Year of the Rookie". ^ Lantz, Jessica (April 25, 2012). "Candace Parker Re-Signs Multi-Year Deal With Los Angeles Sparks". ^ "Candace Parker Re-Signs with Los Angeles Sparks - WNBA.com - Official Site of the WNBA". ^ "10/20/16: Los Angeles Sparks @ Minnesota Lynx - WNBA.com - Official Site of the WNBA". ^ "Two-time WNBA MVP Candace Parker Extends Contract with Los Angeles Sparks - Los Angeles Sparks". ^ "Fifth Women's Junior World Championship Qualifying Team -- 2004". USA Basketball. February 20, 2014. Archived from the original on September 12, 2015. Retrieved October 20, 2015. ^ a b "USA Basketball Women's National Team To Tip-Off Training Tomorrow In D.C." USA Basketball. Archived from the original on July 16, 2012. Retrieved October 1, 2009. ^ "Omitting Parker is a bad call by USA Basketball". ^ "Was Candace Parker Left Off The Olympic Team Because She Wears adidas? - Nice Kicks". May 2, 2016. ^ Favor, Sue (November 8, 2017). "Parker, McCoughtry declined USA Basketball camp invitations for different reasons, agent says". Women's Hoops World. Retrieved April 2, 2018. ^ "Candace Parker to play for Guangdong in WCBA playoffs - Shanghai Daily". www.shanghaidaily.com. ^ fanatik. "Fenerbahçe'yi bombayı patlattı: Candace Parker". Fanatik. ^ "Fenerbahçe Candace Parker'ı açıkladı!". ^ Staff, Swish Appeal (November 9, 2016). "Divorce coming for Parker". ^ TMZ Sports (April 17, 2018). "WNBA's Candace Parker Pays $400k In Alimony … To Divorce NBA Hubby". TMZ.com. Retrieved December 27, 2018. ^ Reid Chemer, "Candace Parker Stars in New PETA Ad," USAToday, May 14, 2010. ^ a b "Sparks' Parker wins rookie of year, MVP honors" (Press release). ^ "Parker, Tennessee thrash Ole Miss to reach Final Four". Archived from the original on February 3, 2013. Retrieved March 27, 2007. ^ "Parker named to USBWA Player of the Year". Archived from the original on October 7, 2008. Retrieved March 31, 2007. ^ "All CP3 All The Time". Retrieved March 31, 2007. ^ "CANDACE PARKER NAMED 2006-07 HONDA AWARD WINNER". April 17, 2007. Archived from the original on July 17, 2011. Retrieved September 7, 2008. ^ "Basketball Star Candace Parker Awarded 2008 Honda-Broderick Cup". Business Wire. June 23, 2008. Retrieved June 23, 2008. ^ "2007 SEC Women's Basketball Awards Announced". Archived from the original on September 30, 2007. Retrieved February 28, 2007.